Over the past two weeks, the Rebels’ signal caller has been one of the finest fantasy quarterbacks. Against Arkansas and Kentucky, Mississippi scored 37 points in each game, and the dual-threat competitor ignited the offensive onslaught with 750 passing and 84 rushing yards. He also completed 73% of his passes and totaled 6 touchdowns. On Saturday, the Rebels host the Ragin’ Cajuns and are huge favorites. The Louisiana defense has surrendered over 40 points five times this season, and Mississippi easily scores five touchdowns behind Ta’amu’s guidance. The Commodores are home favorites against one of the worst pass defenses in the nation: The Wildcats surrender over 270 passing yards per game and have permitted 17 aerial strikes. At home, Vanderbilt lost againt the two paramount teams in the nation (Georgia and Alabama), but won its other three games. Shurmur has tossed 20 aerial strikes this season and passed for 1,884 yards. The junior field general will find plenty of holes in the Kentucky secondary and throw for over 250 yards and three touchdowns. Examining players available on waiver wires, it is striking that Karan Higdon remains a free agent in 62% of leagues. When coach Jim Harbaugh finally gave Higdon more carries, the junior tailback responded over the last four games with 603 yards on 74 carries and eight touchdowns. The Wolverines travel to Maryland, and the Terrapins employ a paper thin run defense, relinquishing 174.8 yards per game and 18 rushing touchdowns. Higdon exceeds 150 rushing yards for the third time in five games and scores twice for the third consecutive contest. The matchup jumps off the spreadsheet between Kelton Moore and the atrocious San Jose State run defense, which ranks dead last in the FBS. The sophomore runner has exceeded 100 yards rushing and scored over 20 points in three of the last four games. For the season, Moore has averaged 6.0 yards per attempt, rushed for 649 yards and scored four times. If unclaimed, the Wolf Pack runner could lead a college fantasy diehard to victory this weekend. How poor has the Bruins’ front seven played lately? In the last three games, Utah rushed for 272 yards and two touchdowns, Washington rambled for 333 yards and five scores and Oregon totaled 246 yards and two touchdowns. There is no reason to assume that UCLA has remedied its defensive shortcomings. 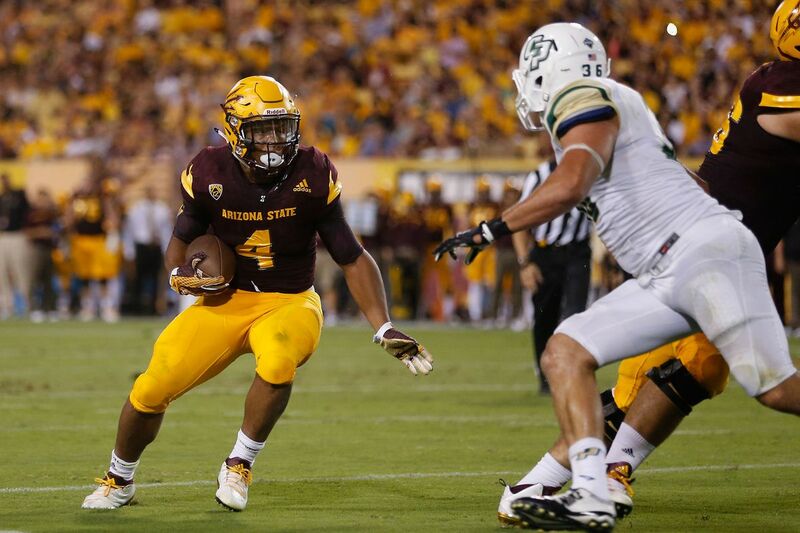 The Sun Devils have given Richard significant carries (58) during the past three contests, and the senior has answered the call to duty with 352 rushing yards and two touchdowns. If a college alternative-reality manager desires backfield help, Richard can provide a scoring boost on Saturday. Quietly, Tyre Brady has emerged as a valuable fantasy asset. He has snatched 55 passes for 776 yards and seven touchdowns. At 6-foot-3 and 208 pounds, the junior provides quarterback Chase Litton with a big and reliable target in the aerial assault. The Thundering Herd clash with the Hilltoppers, and Brady will garner at least eight targets on Saturday. The matchup does not look stupendous, but Brady will exceed expectations. In two of the last three games, Korey Robertson has totaled over 120 yards receiving, and for the season, he has eclipsed 100 yards in three outings. He leads the team in every receiving category with 51 catches for 702 yards and seven touchdowns. Against the pass, Rice ranks #81, allowing 231.7 ypg, and 16 touchdowns. At 6-foot-2 and 210 pounds, Robertson takes advantage of the Owls secondary and surpasses the century mark for the fourth time. Las Vegas projects a positive game script for the Wolfpack’ passing attack: North Carolina State is an underdog and should be playing from behind in the fourth quarter. Quarterback Ryan Finley spreads the ball around to a myriad of game breakers; however, Harmon is the big-play receiver downfield. The sophomore averages 15.7 YPC on 51 receptions for 799 yards and four touchdowns. He has five games with over 100 yards and will likely make it six on Saturday.